Property 4: Contemporary New England Apartment With Private Entrance In Kingsbridge, Devon. Holiday on a Converted Cider Farm with indoor pool, tennis court and playroom. Property 7: Holiday on a Converted Cider Farm with indoor pool, tennis court and playroom. 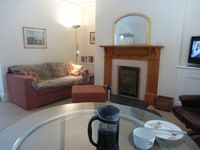 Apartment With Sea Views Of South Sands Beach, Salcombe With Parking for 2 cars. 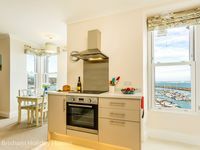 Property 8: Apartment With Sea Views Of South Sands Beach, Salcombe With Parking for 2 cars. Elegant, modern, unusually spacious. 45 seconds from river, shops, cafes & restaurants. Property 9: Elegant, modern, unusually spacious. 45 seconds from river, shops, cafes & restaurants. UpperDeck. Cosy cottage style. 30 seconds from best views in town. Property 15: UpperDeck. Cosy cottage style. 30 seconds from best views in town. Beautiful Apartment in Town Centre, with Garage parking. Property 28: Beautiful Apartment in Town Centre, with Garage parking. Character Apartment refurbished to a high standard in Salcombe Town, Sleeps 5. Property 39: Character Apartment refurbished to a high standard in Salcombe Town, Sleeps 5. Wow, where to start. Fantastic location. Beautiful apartment, spotlessly clean. Beautiful views. Coastal path on your doorstep which takes you into Brixham Harbour. Approx a 10 minute stroll. In front of the apartment you will find the Breakwater. This is a measured 1/2 mile walk out to sea and the lighthouse and the 1/2 mile walk back gives you a good appetite for your breakfast at the local Breakwater Bistro. There are plenty of bars and restaurants to choose from. The coastal path in the opposite direction takes you to Berry Head, an area of outstanding beauty. This will only take you at a leisurely pace about 25 mins to reach and well worth the walk. We did not use our car all week. We left it in the lower level car park which is included in the price of the accommodation. The car park being only 2/3 minutes away. Local buses from Brixham take you along the coast to Paignton &amp; Torquay. These run every 10 mins and you can buy a &pound;5 day ticket which is superb value. Lastly and not least, the apartment is run by a lovely couple John &amp; Emma, who leave you to enjoy your holiday but are there if you need anything with John pointing us in the direction of a couple of good bars :) Thank you for a wonderful holiday. Exactly as pictured, light &amp; airy even on cloudy days, nice lamps after dark. Didn't get text re where to find the key once inside the front door as no British SIM card yet, another guest mercifully saved the day, as Lucy was out of town until later in our stay. Nicely heated to take the clammy chill off on arrival day, immaculate throughout. Kitchen well-appointed, spacious fridge &amp; freezer. Never did fathom how 50&quot; wide sofa would turn into sofa bed, so not the best sleep there. Enjoyable British TV, good selection of channels, wi-fi fast. Bedroom comfortable, shower excellent, pretty &amp; comfortable bedding &amp; bath linens, would have appreciated a dish cloth (used my wash cloth). Electric switches would benefit from labels for those of us unaccustomed (but appreciative, North America should emulate) to kitchen &amp; bathroom water heaters (never did find towel heater switch). Drapes would benefit from pull rod, felt unsafe balancing on edge of bed, one hand on wall, the other cautiously tugging from smaller&gt;larger diameter of rod. That said, we would definitely return!